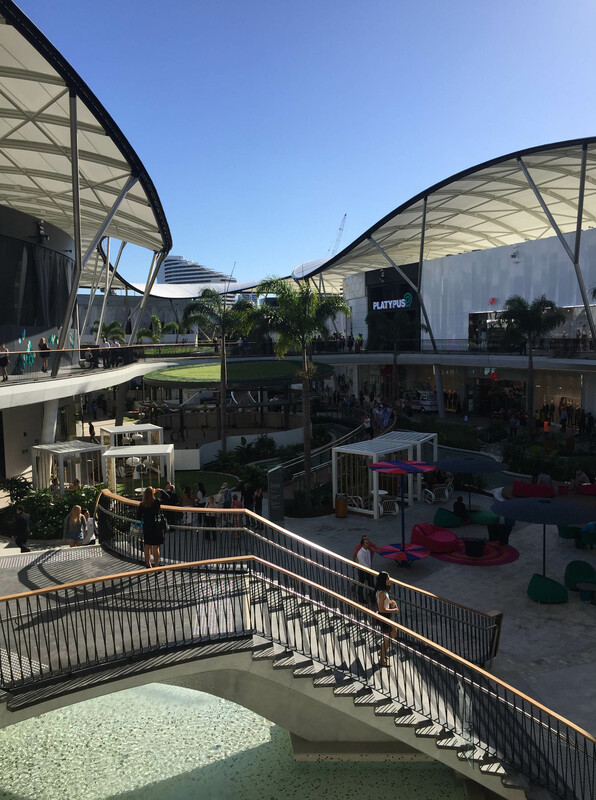 The retail industry is booming. 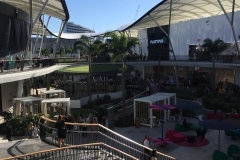 As consumers shift towards a virtual reality where online shopping is quickly taking over bricks and mortar experiences, shopping centres compete for who can offer the most unique retail experience to their visitors. 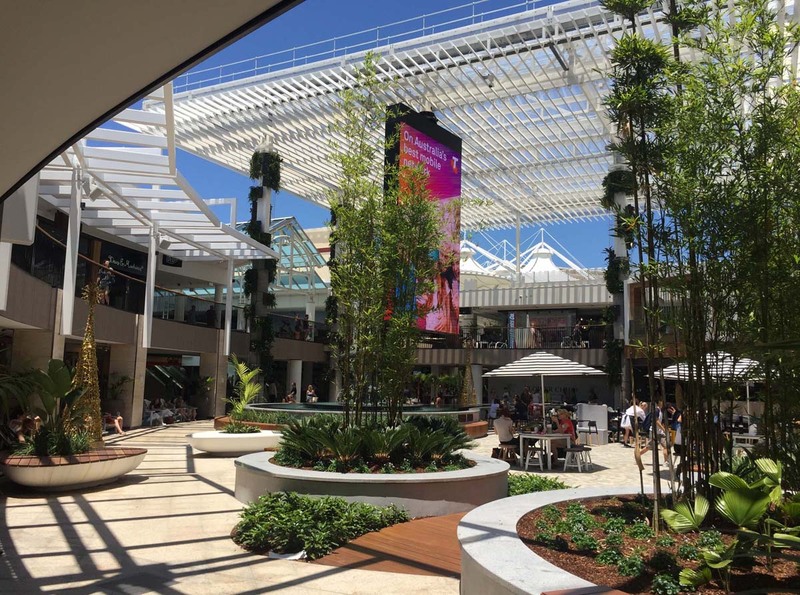 Shopping centre design trends are increasingly focused on offering customers a complete shopping, dining and entertainment experience. 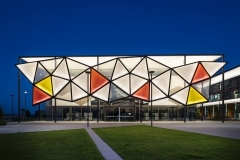 Design objectives are heavily focused on modern facilities and unique structures that compete for some of the top architectural design awards in the world. 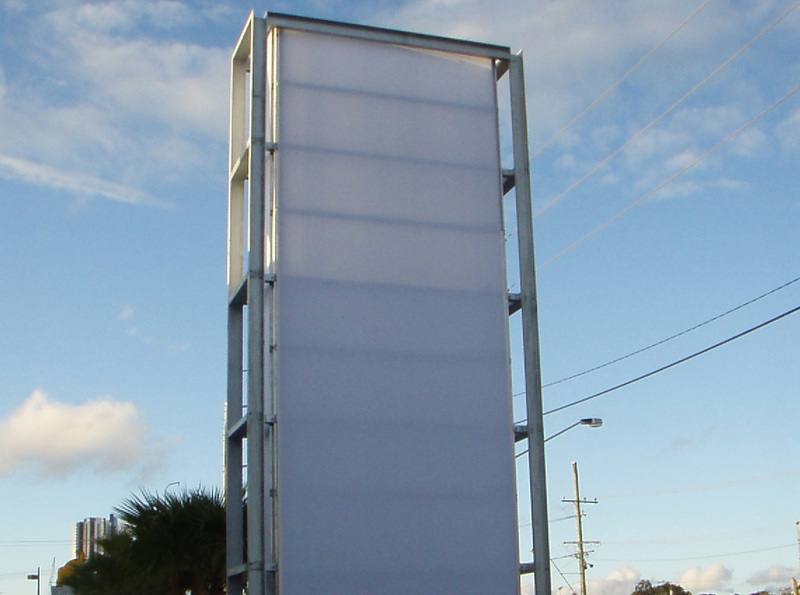 Designers and architects are always looking outside the box for innovative solutions. 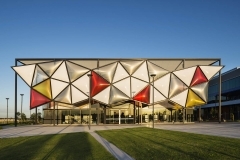 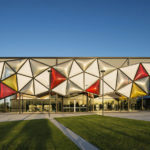 This is why fabric-based architecture and ‘special projects’ incorporating complex structural steel and artistic aluminium cladding panels are becoming more popular every year. 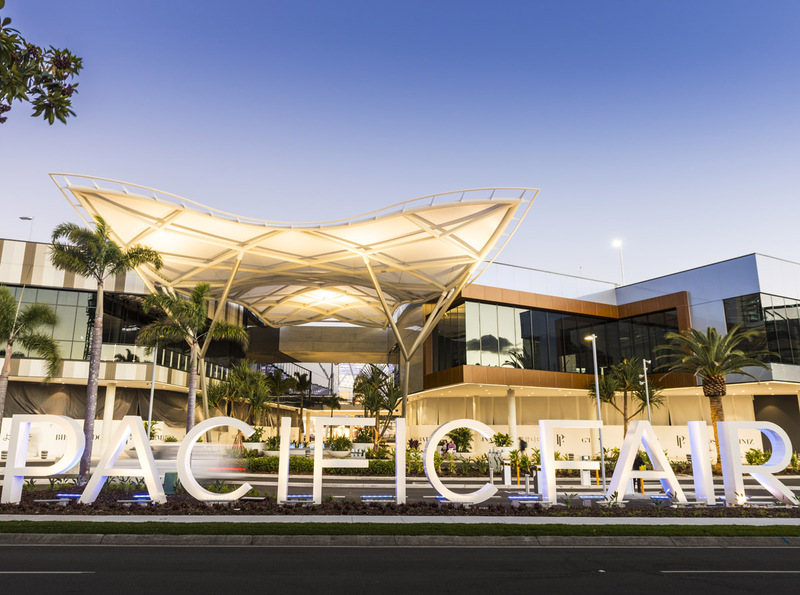 Fabritecture often comes on board in the early stages of design as a D&C contractor, where builders and architects struggle to find contractors to complete the works. 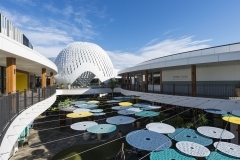 The design objectives of shopping mall projects are often specific and unique. 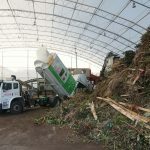 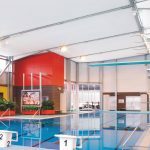 There are many elements that go into choosing the right materials to complete the design intent, which is why it’s critical to choose an experienced team of professionals for the works. 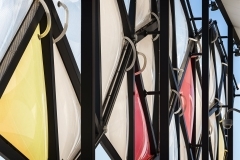 You can learn more about materials in our Knowledge section. 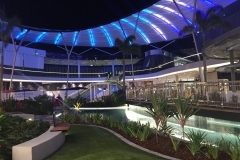 Architects and shopping centre designers create amazingly unique feature structures that work with the exterior design and layout of the mall. 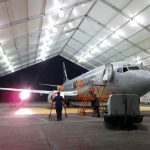 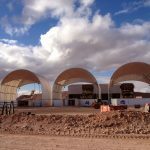 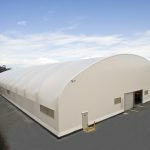 Fabritecture works closely with the design team and client to produce high quality structures with safe installations that meets the design intent and client expectations. 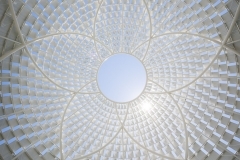 A complex architectural PTFE masterpiece. 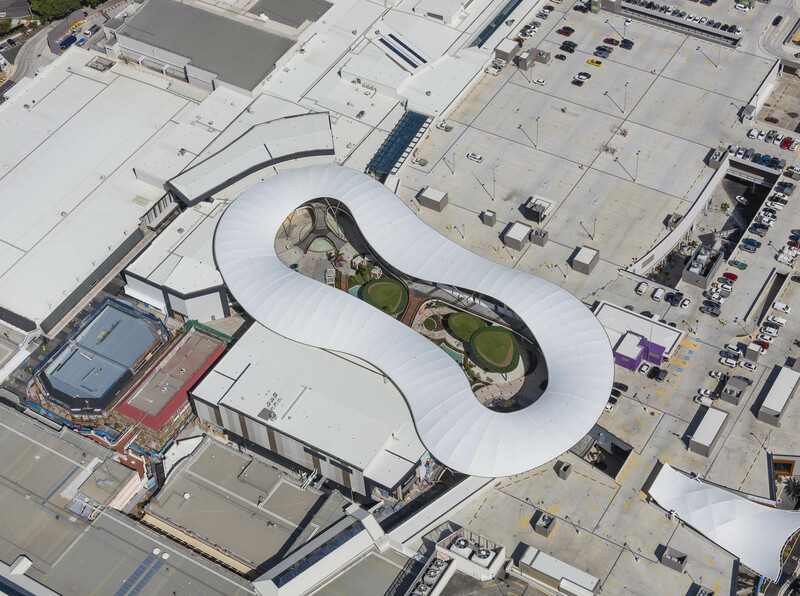 The Resort Roof comprises of a dia-grid ribbing roof that is 360 lineal meters with crazy curvature throughout. 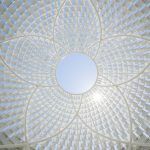 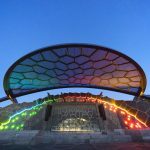 A programmable LED lighting system sits in the structure’s rafters that projects extraordinary images and patterns through the PTFE fabric membrane. 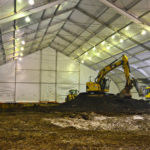 Click here to view this project. 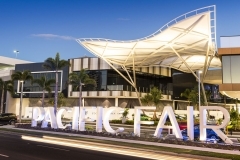 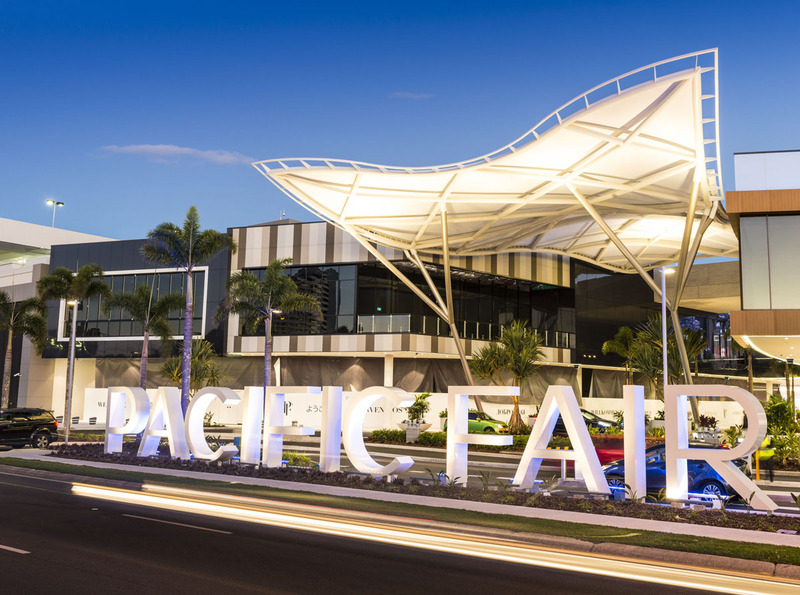 Click here to view the Pacific Fair Case Study. 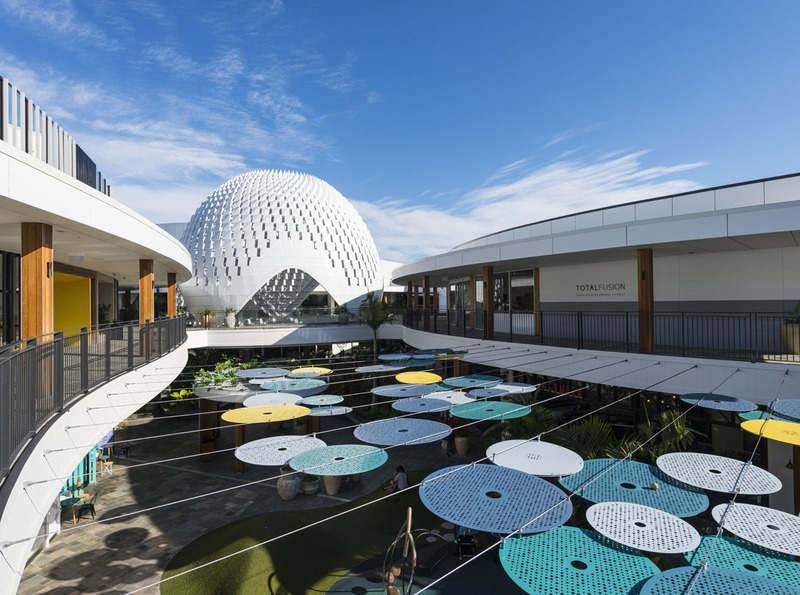 The Urchin is like nothing seen in any retail centre in Australia. 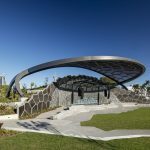 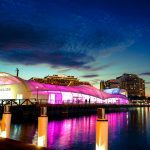 The large aluminium-clad architectural structure has an integrated LED lighting system that reflects programmable patterns off the white aluminium cladding panels. 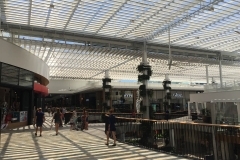 Click here to view this project. 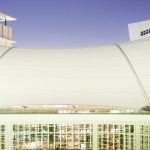 Four large single-skin clear ETFE roofs over the atrium mimic glass but at a fraction of the weight. 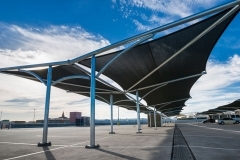 Approximately 9km of aluminium louvers and bird proofing mesh cast unique, intentional shadowing below. 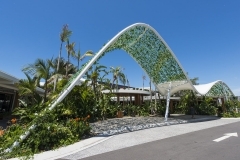 Click here to view this project. 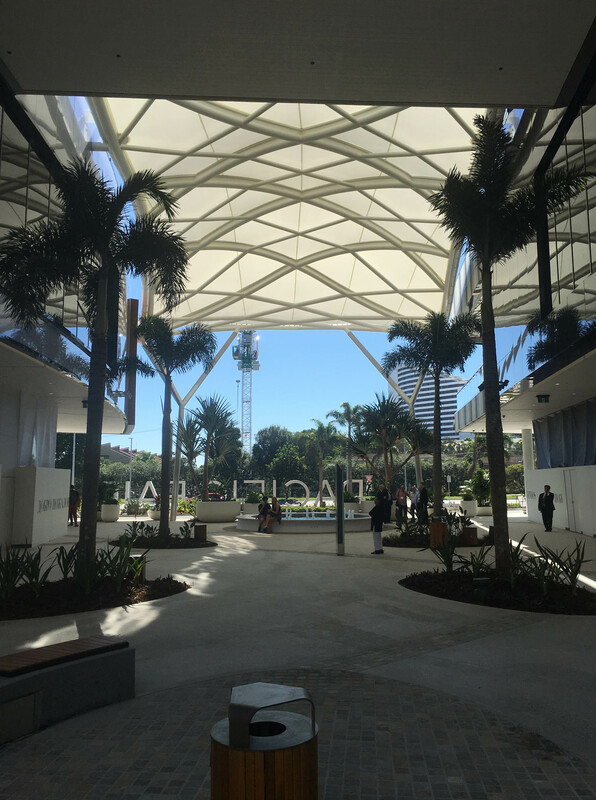 Shopping mall entry structures are responsible for thousands of first impressions every day. 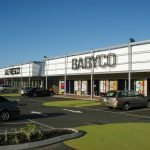 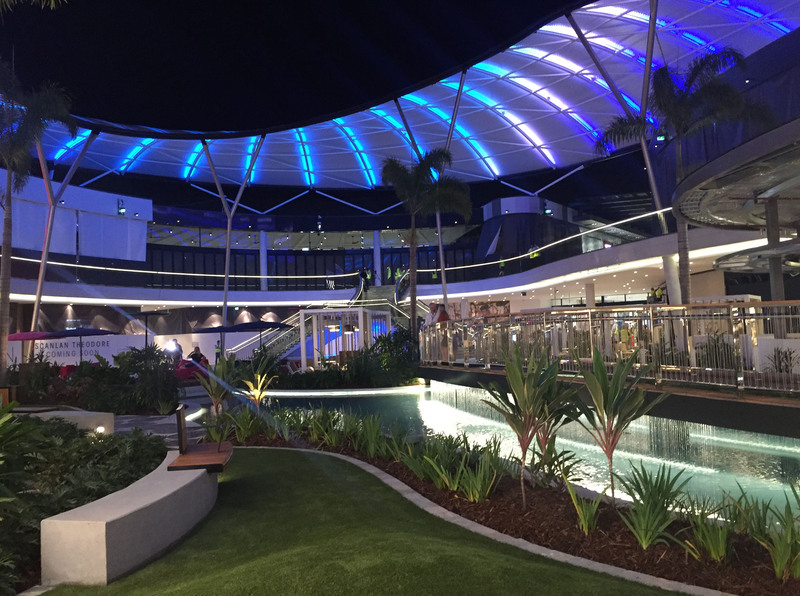 It’s essential that the exterior of your shopping centre matches the design intent for the entire retail space, and has the ability to captivate attention and draw people in. 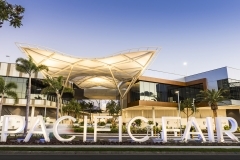 The crown of the main entry point of Pacific Fair, the Porte Cochere provides a dramatic architectural feature to draw people into the centre. 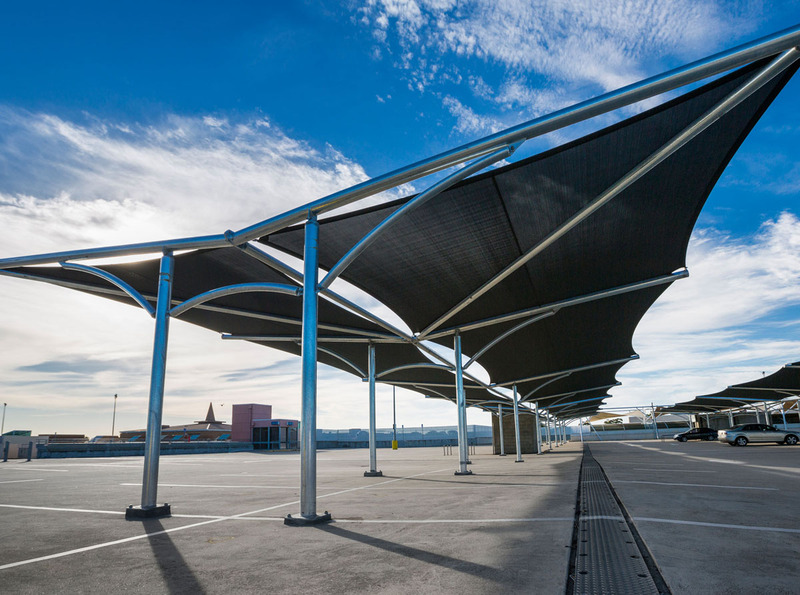 Functional and iconic. 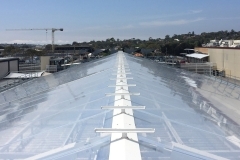 Click here to view this project. 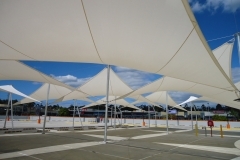 Designed to match the overall intent of the centre. 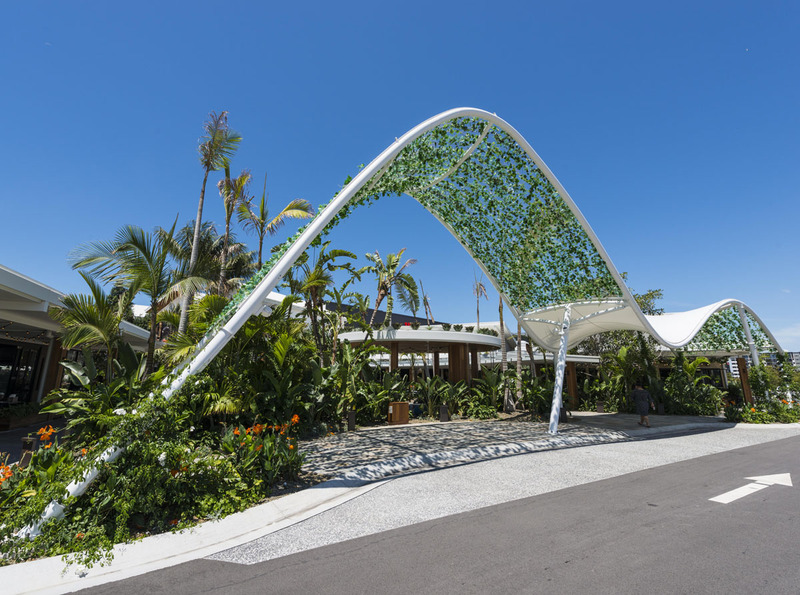 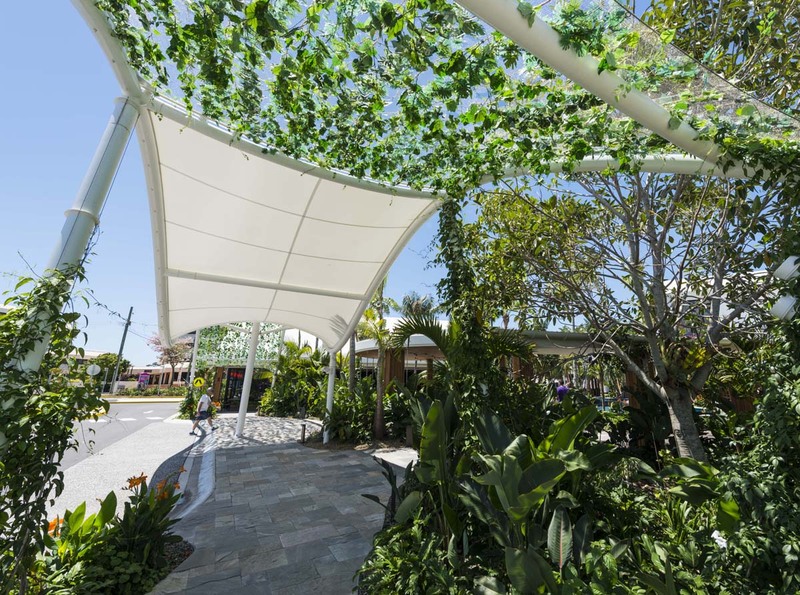 A functional, beautiful entrance canopy that incorporates nature with vines intertwined throughout the mesh and steelwork. 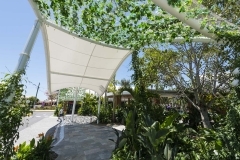 Click here to view this project. 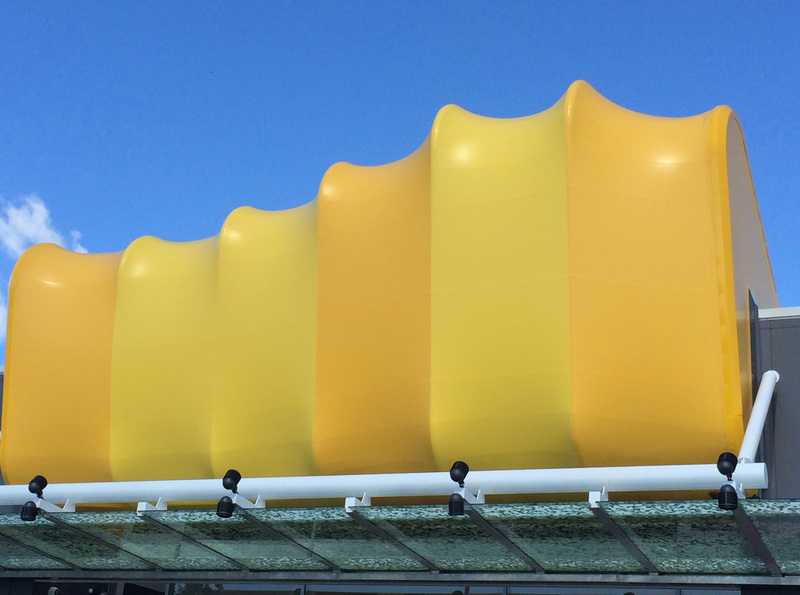 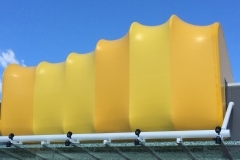 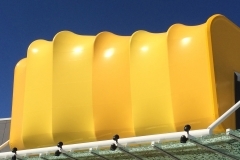 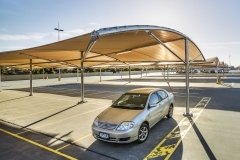 Four individual entrance canopies made from steel framing clad in alternating yellow and gold PTFE fabrics. 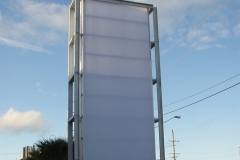 Click here to view this project. 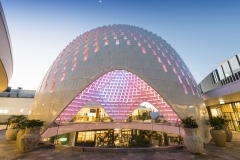 Facades completely reshape the look of any building or structure. 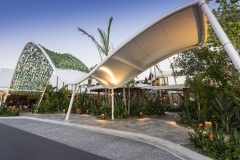 They are one of the most important elements for exterior and functionality. 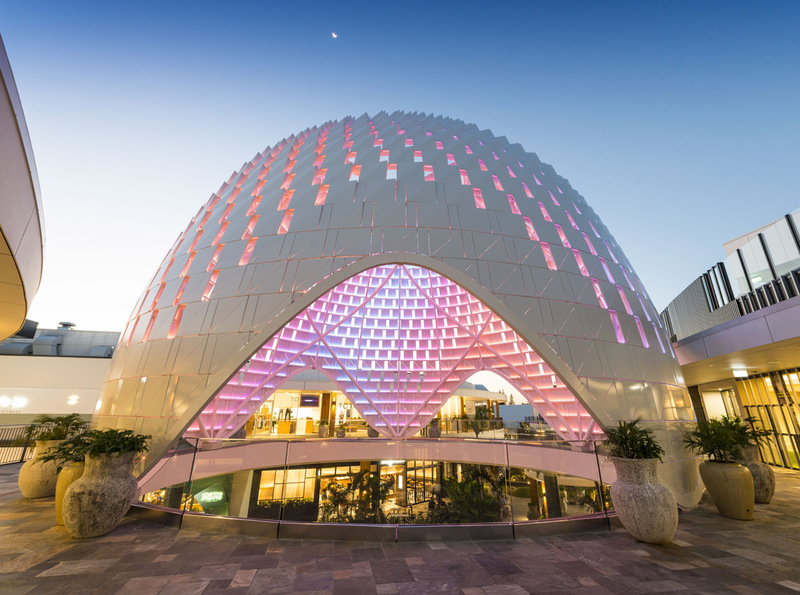 Fabric architecture facades not only create an aesthetic finish, but also act as practical ways to distribute light and control heat. 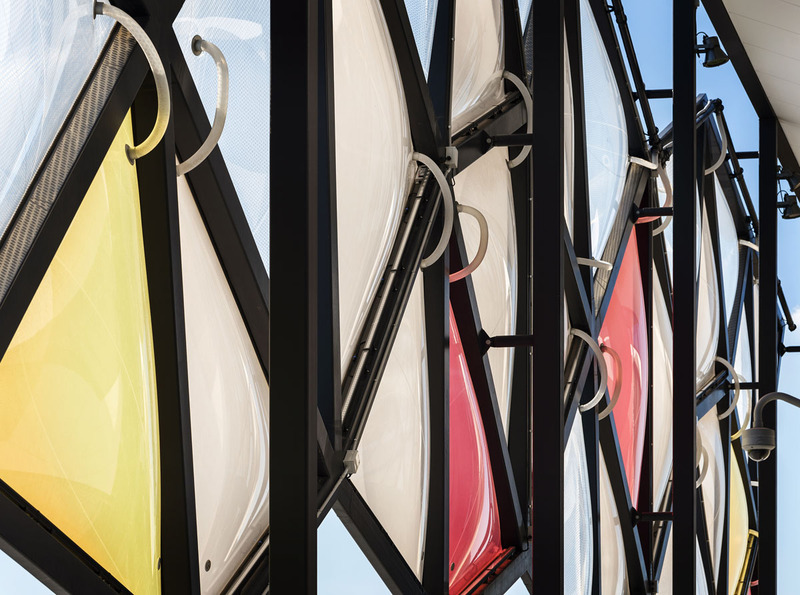 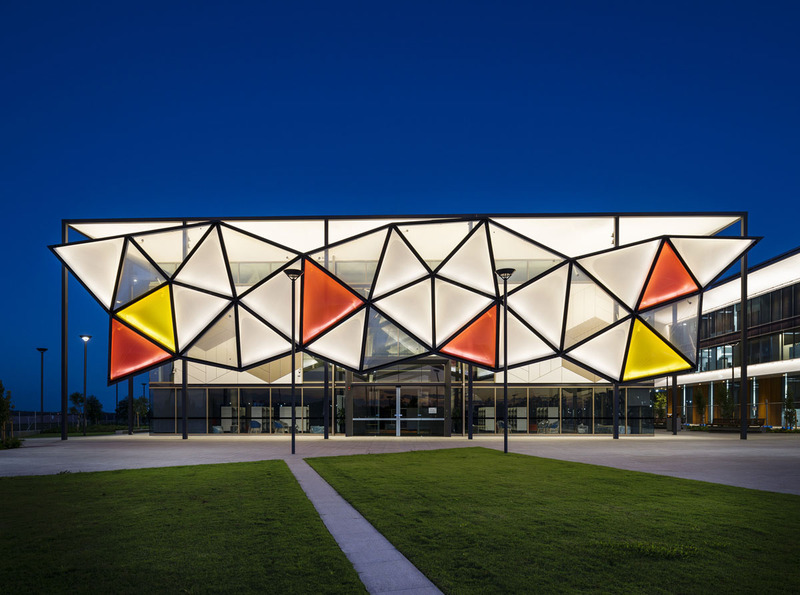 A series of triangular 2-layer ETFE cushions that are a bright, colourful addition to the new Community Library & Resource Centre. 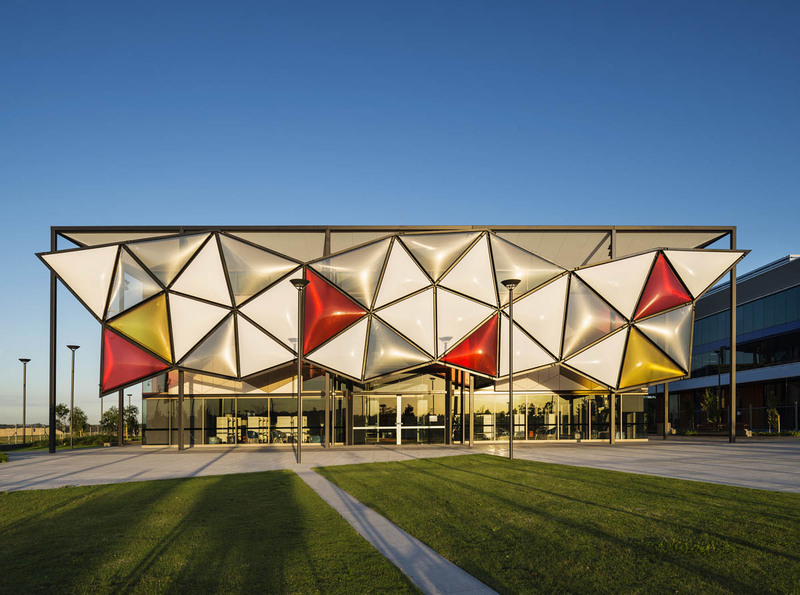 The façade lets sunlight through to the building behind, while allowing heat from Western sun to dissipate before it reaches the inside of the library, cooling the building. 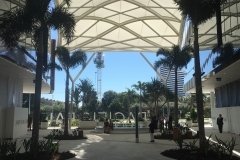 Click here to view this project. 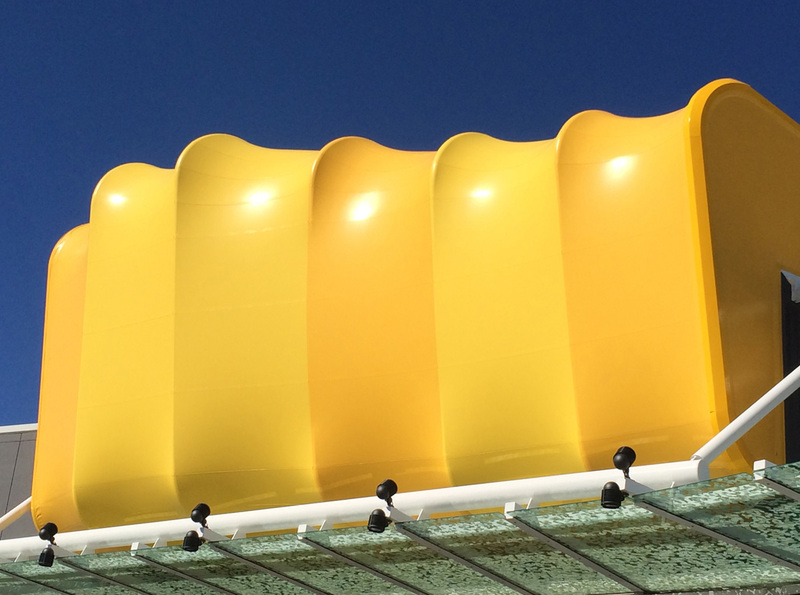 A functional façade that creates aesthetic shop fronts, giving a clean, fresh look to the centre. 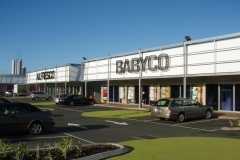 Click here to view this project. 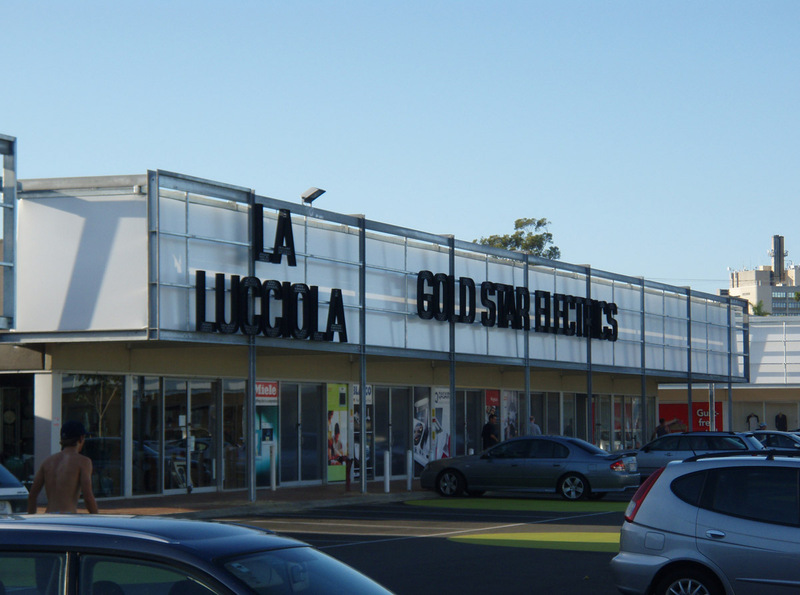 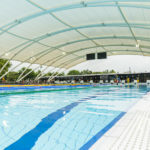 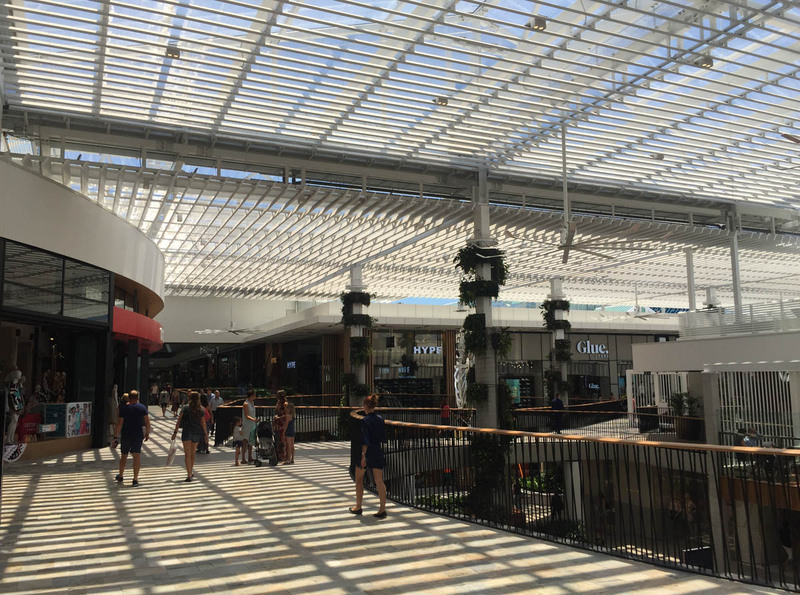 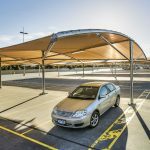 Fabric structures are a popular choice for shopping centres as we can provide hypar shade structures, single and double bay solutions with options to include walkway covers. 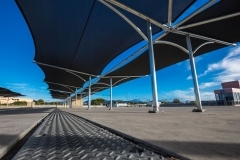 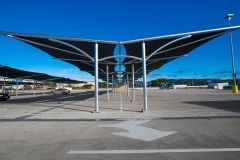 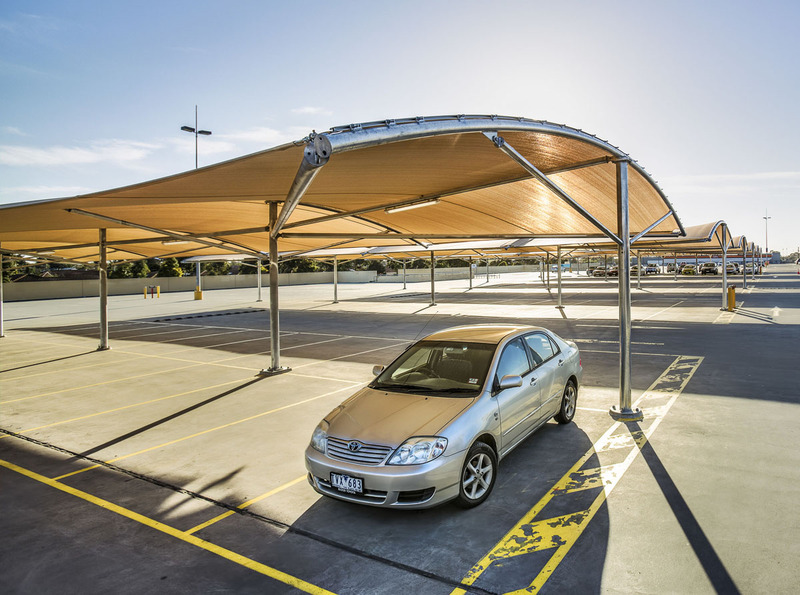 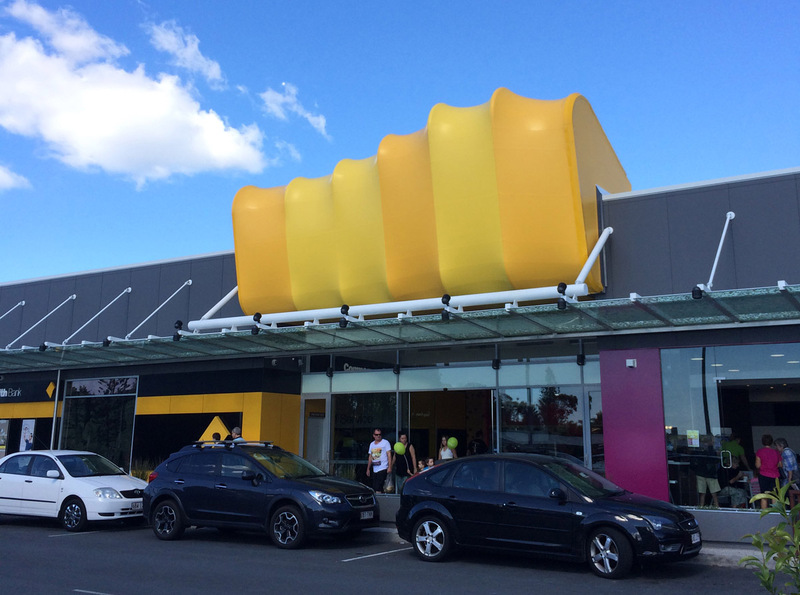 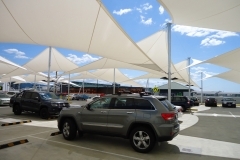 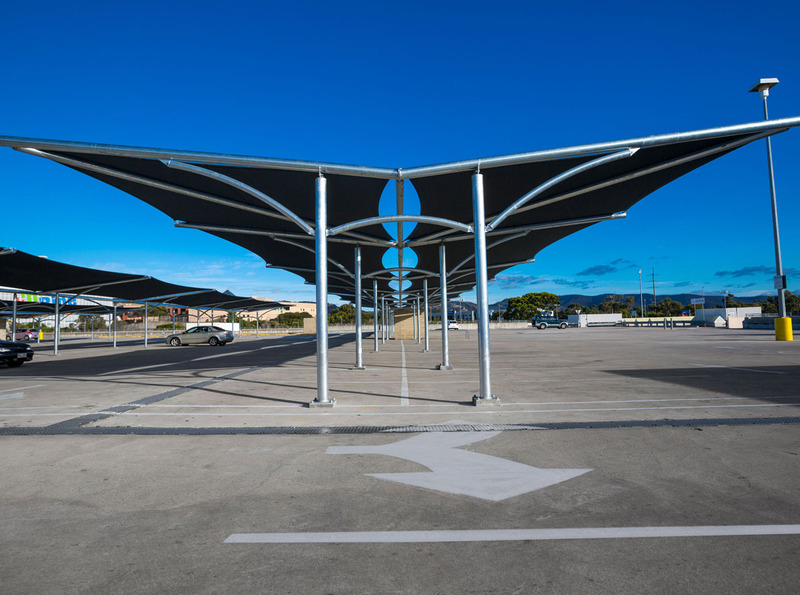 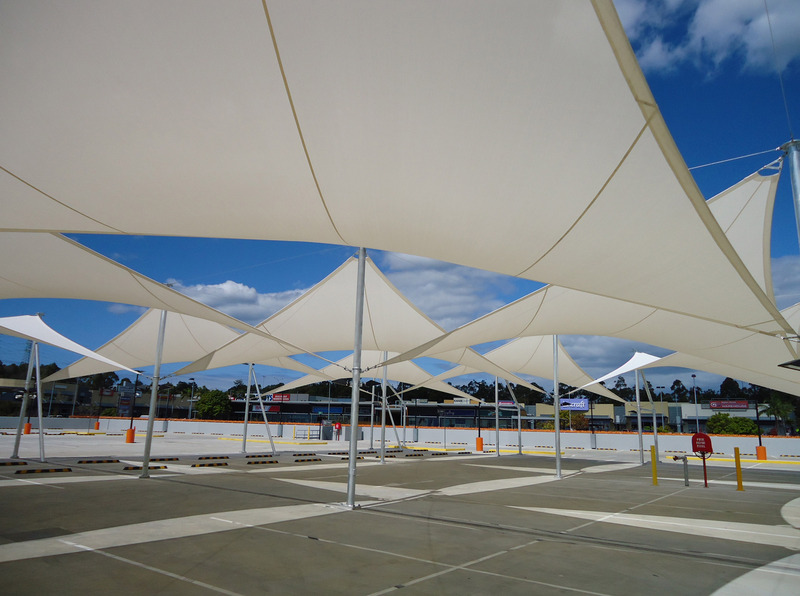 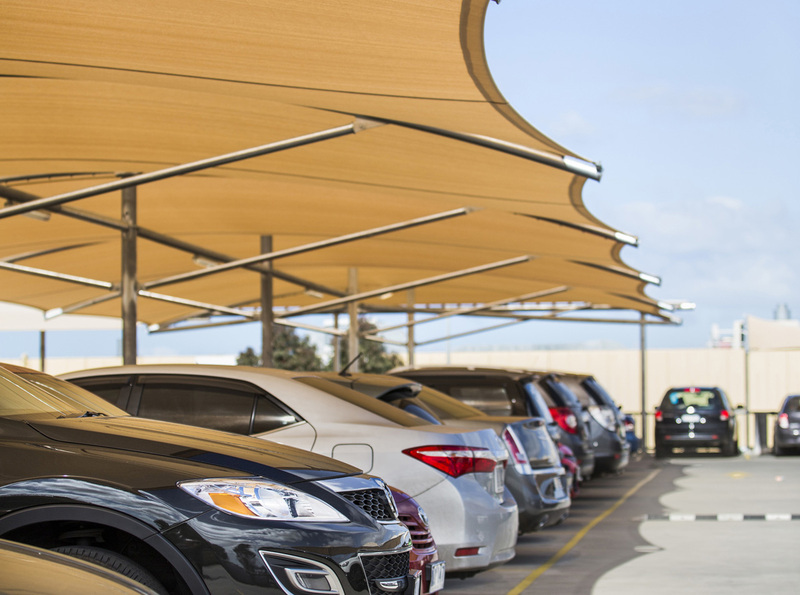 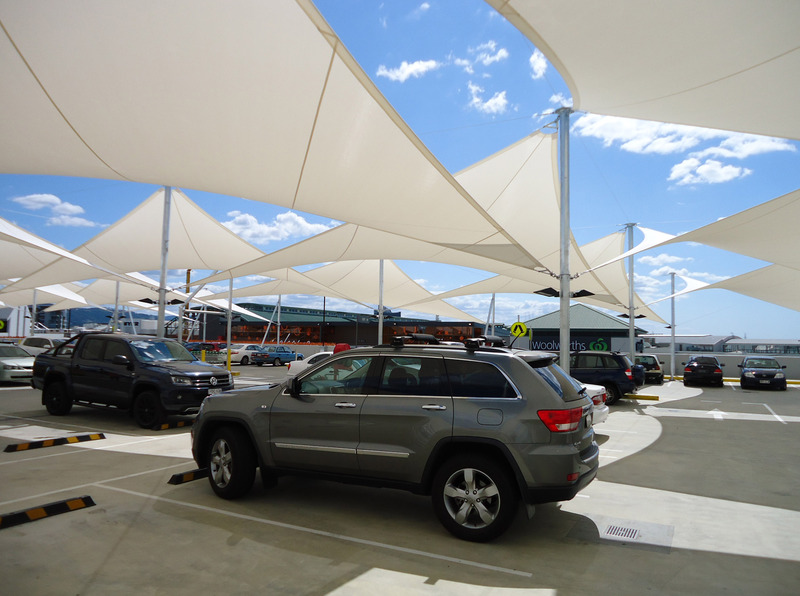 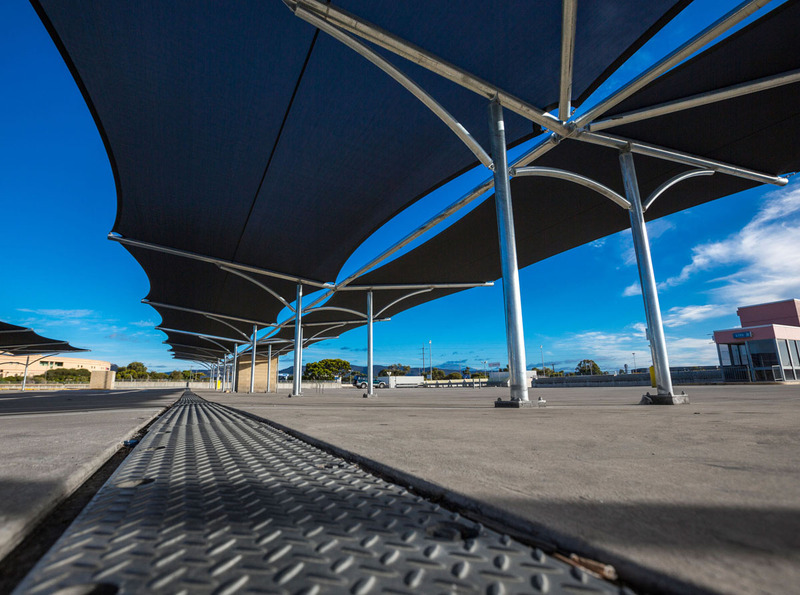 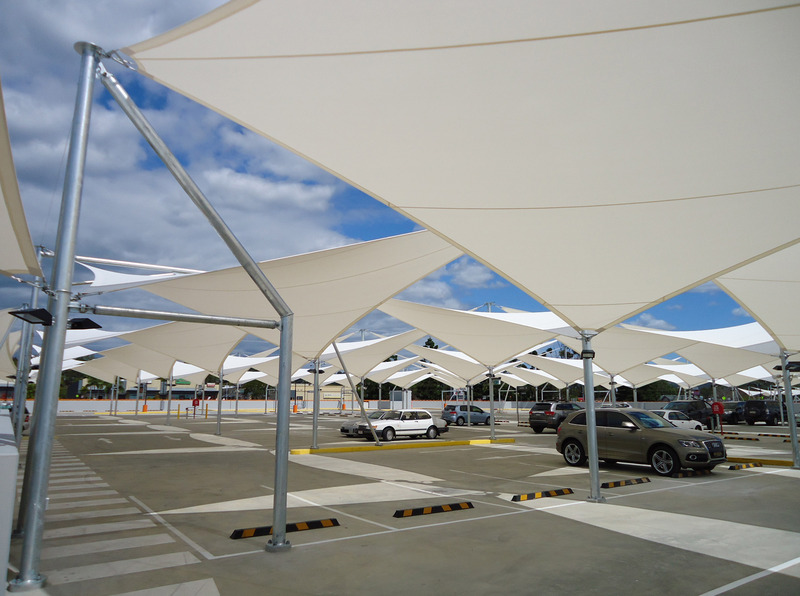 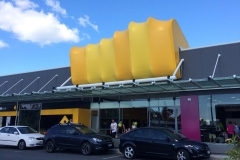 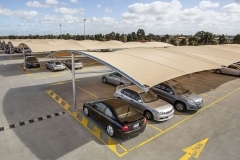 Car park shade structures put customers and their comfort at the forefront of the retail experience. 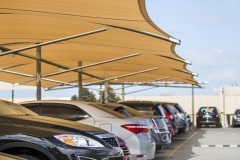 Custom barrel vault structures that provide plenty of undercover protection for shoppers. 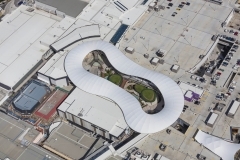 Click here to view this project. 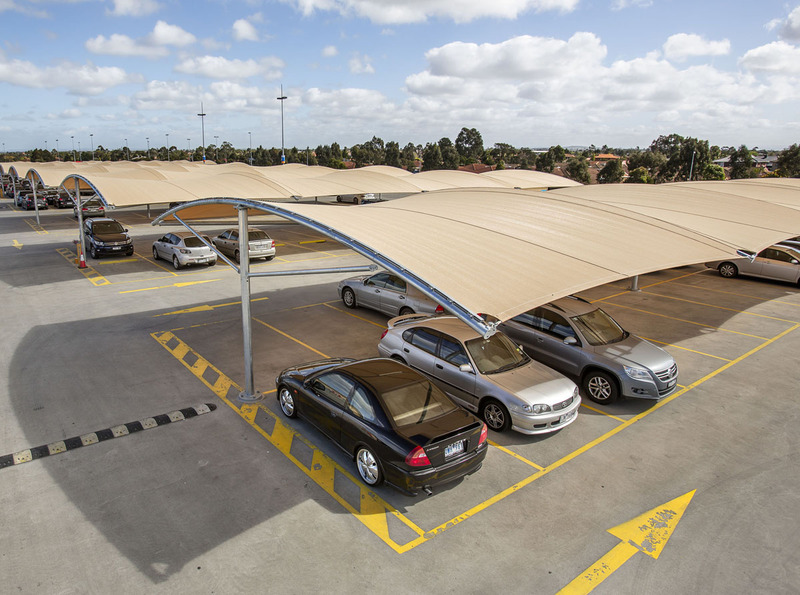 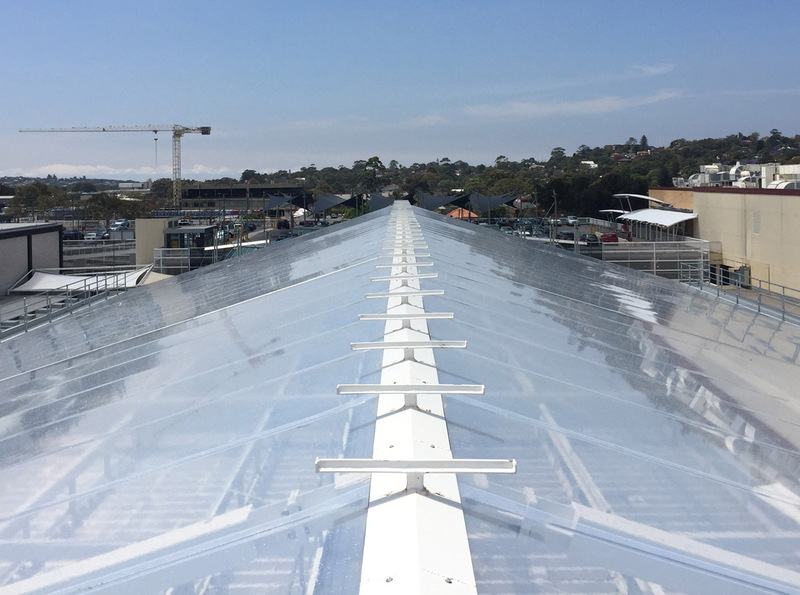 Large hypar-style car park structures that utilise 9,000m2 of Monotec 370 Mesh shade cloth on the roof of 2 multi-story car parks. 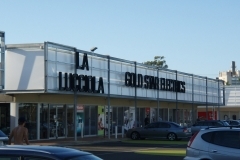 Click here to view this project. 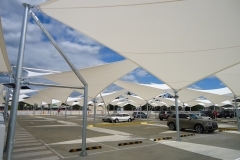 Custom barrel vault car park structures that provide weather protection and a more comfortable shopping experience for visitors. 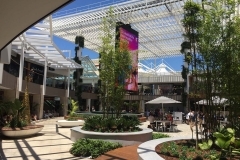 Click here to view this project. 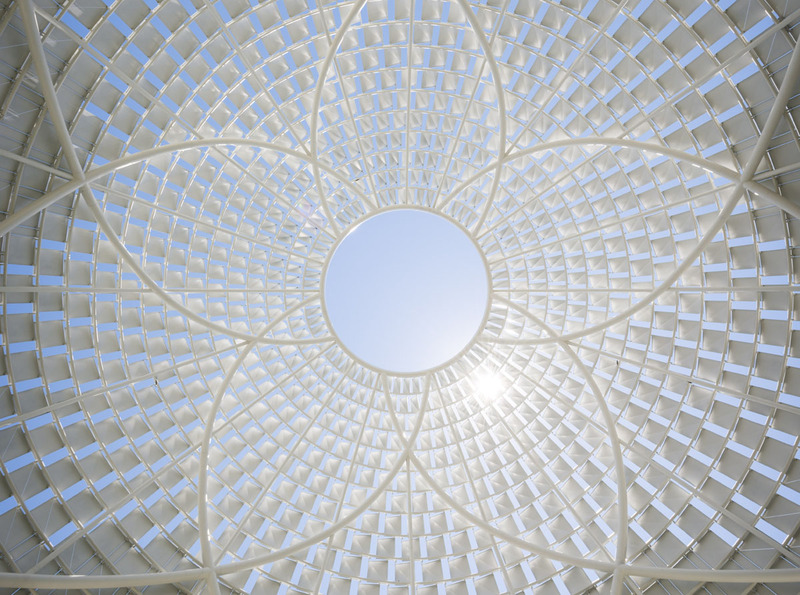 Fabritecture is more than fabric architecture. 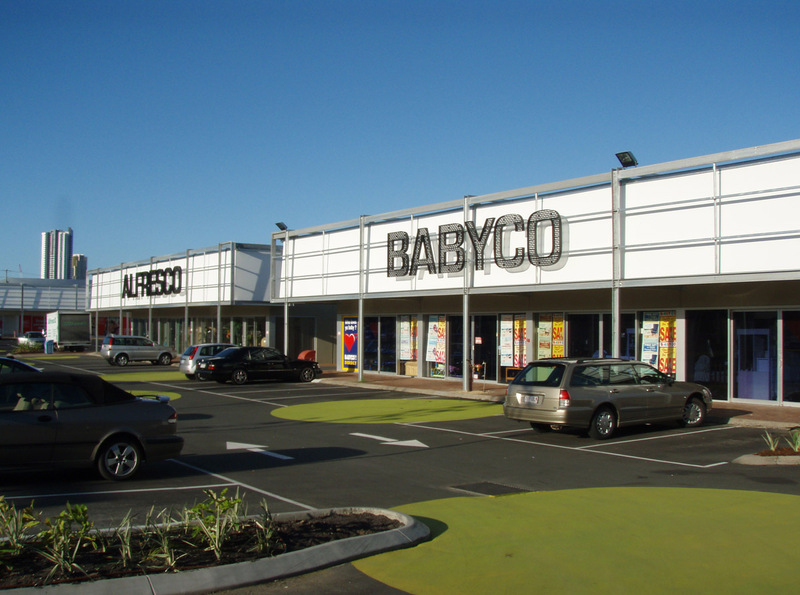 We understand the complex and specific requirements of retail design and installation. 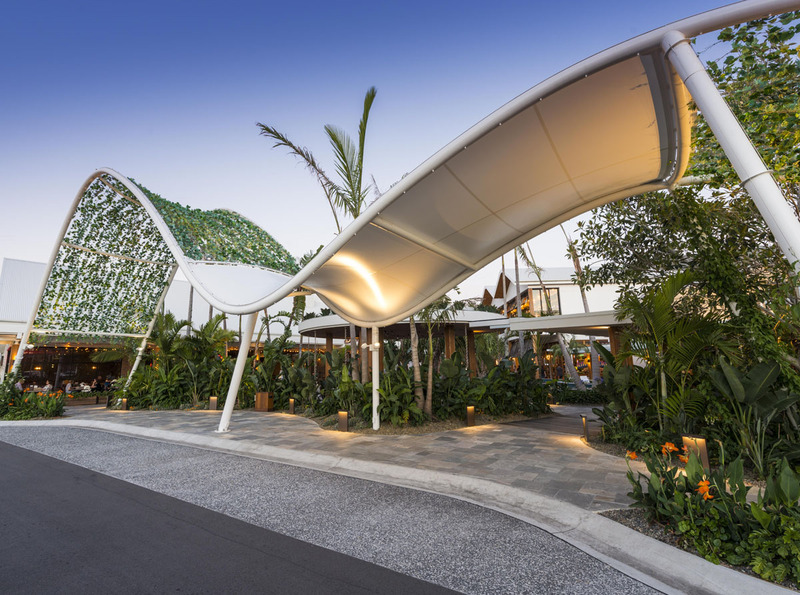 Our qualified and dedicated in-house project management team are experienced and ready to help your dreams take shape.